When editing a photograph in Lightroom, it is often useful to compare what the image looked like when you started out (the “Before”), to the changes you have made so far (the “After”). This way, you can keep track of your edits and understand how the different sliders and check marks within Lightroom affect your image. 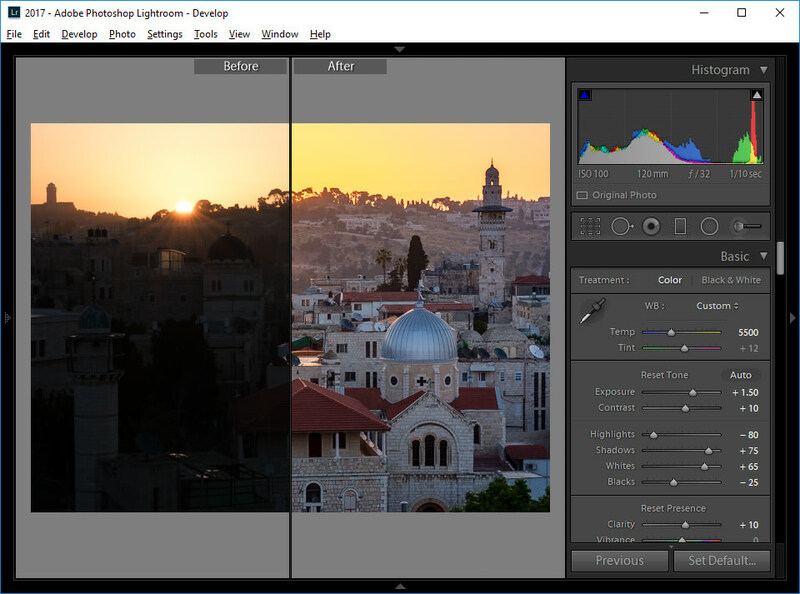 Thankfully, Adobe made it easy to switch between the Before and After screens and provided a number of different ways to view both vertical and horizontal images in a single window. Let’s take a look at this great feature in detail. First of all, it is important to point out that the Before and After feature is only available to use in the Develop module. 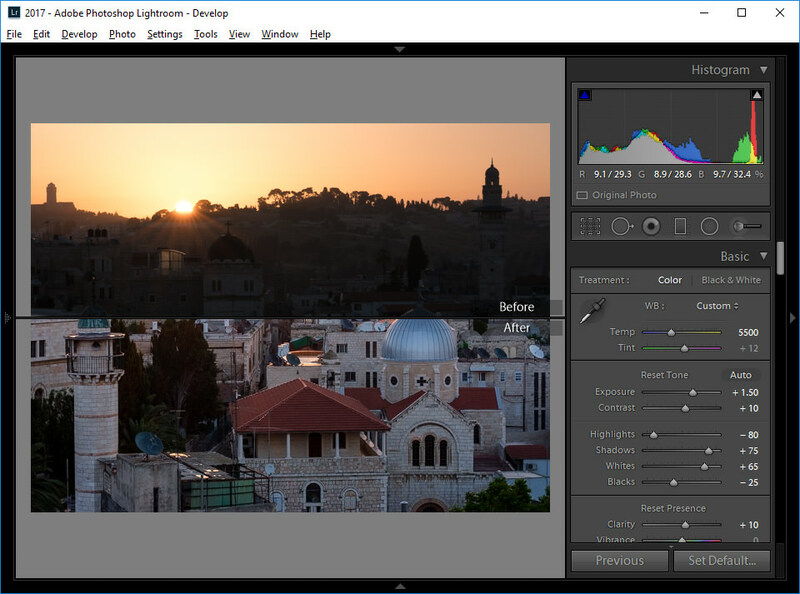 Therefore, you will need to select an image you want to edit, then get into the Develop module by pressing the “D” button on your keyboard (or clicking the “Develop” link on the top module selection area) in order to be able to use the “Before / After” feature in Lightroom. 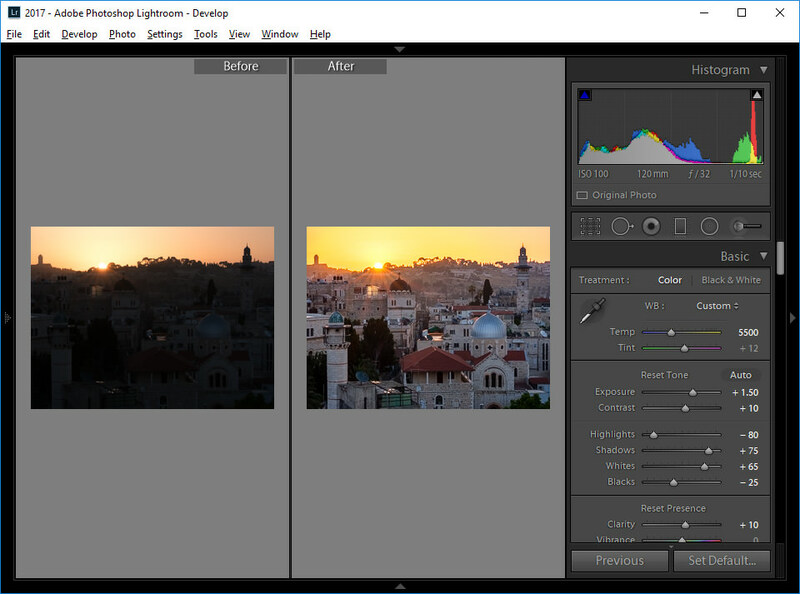 Second, the “Before / After” feature will show all adjustments to the image from every sub-module within the Develop module, except for the “Crop & Straighten” tool. This makes sense, since it would not be a good idea to compare images that do not have the same level of cropping or straightening. Third, it is possible to swap the “Before” state with any of the steps in the “History” panel, as explained below. 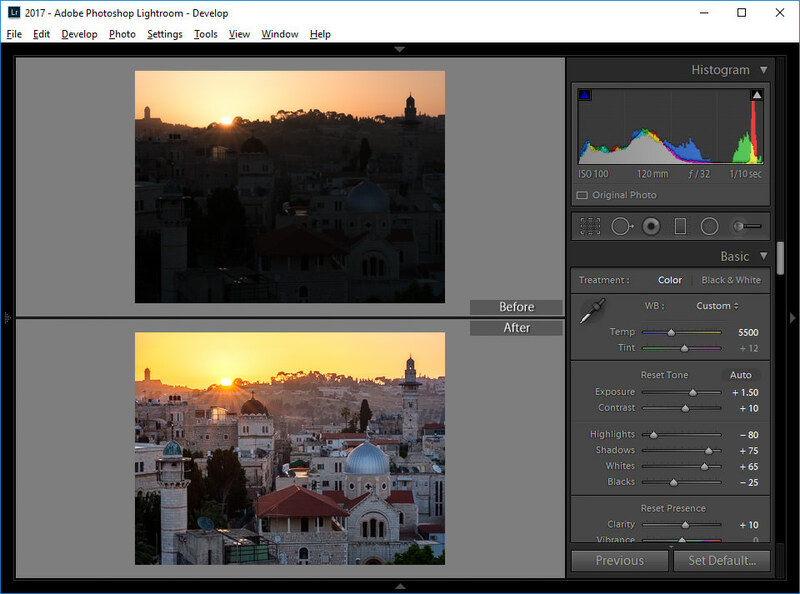 And lastly, the “Before / After” feature is only meant to be used temporarily as a visual guide – it does not impact images that you have already edited in any way, and if you export an image in its “Before” state, you will still end up exporting the edited image instead. As you can see, the image looks completely different – those exposure, contrast, highlights, shadows, whites and blacks sliders, along with all other adjustments in Lightroom made a huge difference in the way the image appears now compared to what it used to be in its original RAW state. I personally like the “Before Only” mode primarily because I get to see the whole image. However, there are cases where it is useful to see the “Before and After” side by side. As you can see, “Left / Right” looks far better when a vertical image is used. You can see more of the image and there is far less wasted space in this view. However, this does not mean that “Left / Right” should only be used with verticals – there is another option that can make side-by-side comparisons of horizontal images pretty useful. It is called “Split Screen”. This can be a great way to see changes to the image without seeing two separate images, as half of the image is split showing the Before and After. Keep in mind though, you are actually physically reversing your image settings! As you can see on the right side of the image, all the sliders have been reset back to their defaults. If I were to export the image in this state, it would export it as the original RAW file without any of my edits. So if you ever do swap the “Before and After”, don’t forget to change it right back by using the same keyboard combination, or you will end up with the unedited image. That’s a lot of ways to see the “Before and After”! As you can see, the “Before and After” feature of Lightroom is quite powerful. Don’t forget to take advantage of this useful tool while editing, as it could save you some frustration when comparing your edits. If you have any feedback or questions, please let me know in the comments section below! Thanks for another great article Nasim. When you get to the before and after image in split screen is there a way to move the slider? I couldn’t figure that out. 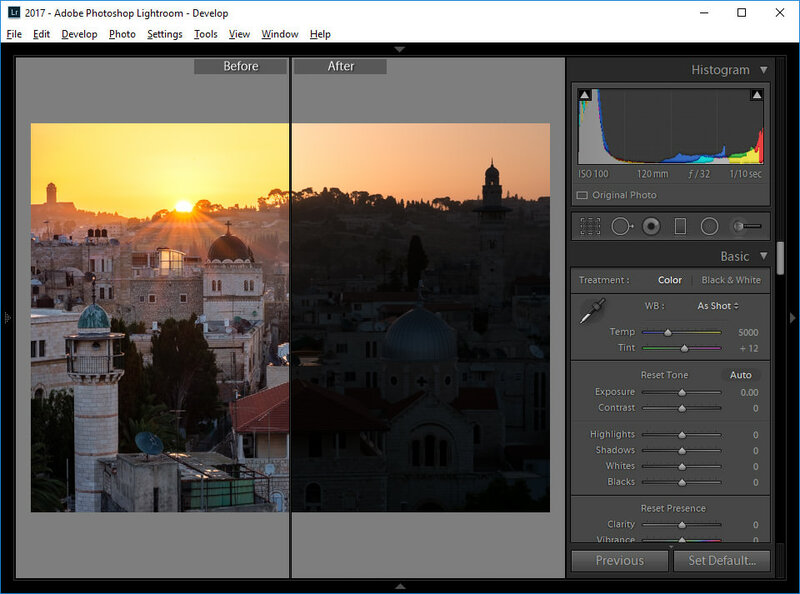 can you print the screen with the before and after in LR. I read through this post, taking it as a reminder of things I more or less knew. But what you wrote in “Changing the ‘Before’ State” was completely new to me. I will use it a lot! Thank you. 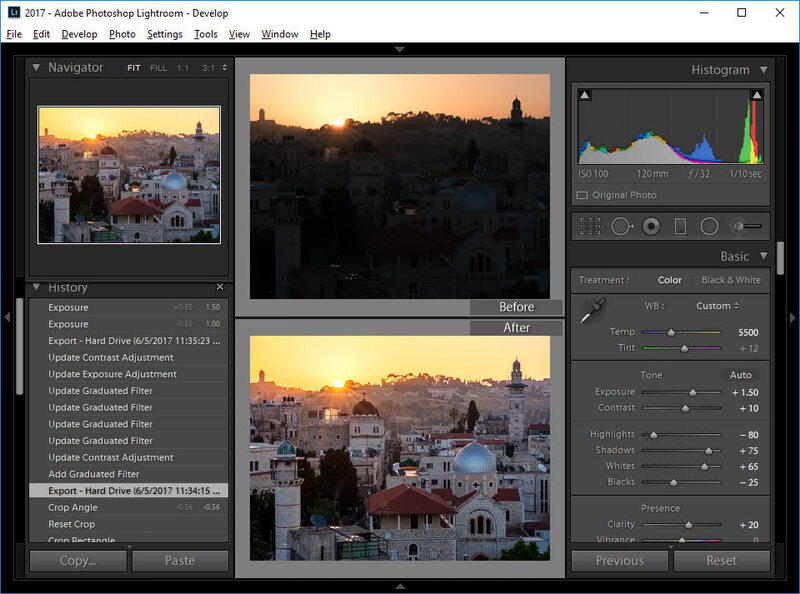 I am having trouble exporting from LR. I notice that you, along with a video I saw from UK export from the Library Module rather than the from the develop module. I sometimes can get it to export from the Library module, but I have never read directions that say it should be done there. And no one in demo videos say that. I usually have to close LR and be sure that everything else is closed on the computer, reopen lightroom and then I can export only two photos before computer completely hangs and has to be rebooted. I am running LR 5.7.1 in Windows 10 with 32 GIG on the motherboard, a 32 GIG thumb drive as a ready boot help. So 64 GIG available– but I keep getting out of memory…. Adobe said they didn’t know. Charles, it really does not matter where you export from – you can export from both Develop and Library modules. The big difference is, you can select more than one image from the Library module, whereas the Develop module is limited to seeing one image. Therefore, if you want to export more than one image, you should do it from the Library module instead. 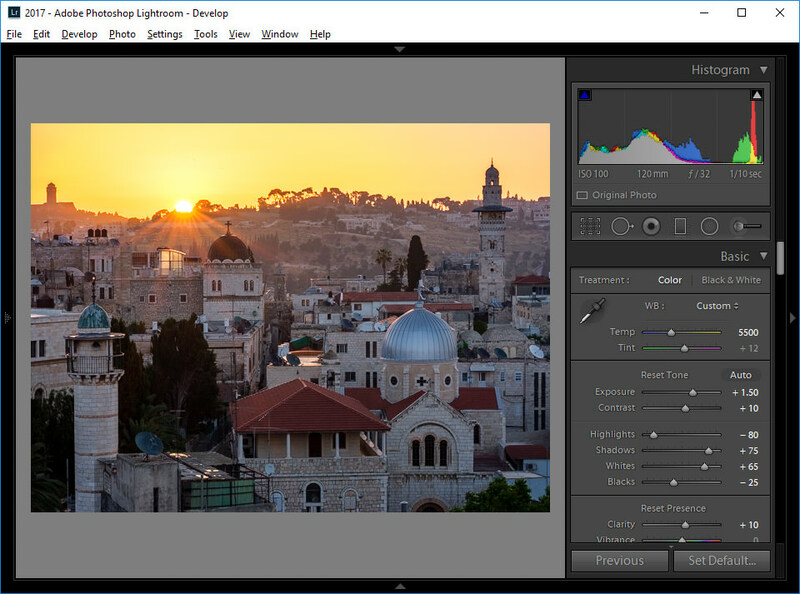 Now your problem regarding Lightroom freezing up and locking your machine sounds very bad – that’s absolutely not normal behavior. Could you please clarify the specifications of your computer? What CPU, RAM and storage do you have on it? Where are the photos located? USB thumb drives should not be used to speed anything up, as their write speeds are abysmal. If you are getting out of memory errors, you most likely have very little RAM available – and Adobe applications need lots of it to properly function. Does Adobe Camera Raw have this same ability? Mac, yes, Adobe CR also has this ability, although the shortcuts are different – I believe the button “Q” is what is used to cycle through the different before / after viewing options. Excellent article Nasim! A question: I frequently see ‘snapshots’ of before/afters in articles/blogs. Is this dones by taking a snippet of the LR window? Thanks! Very good professor. You make it seem simple as any good professor does. First of thank you very much for the article Nasim ! 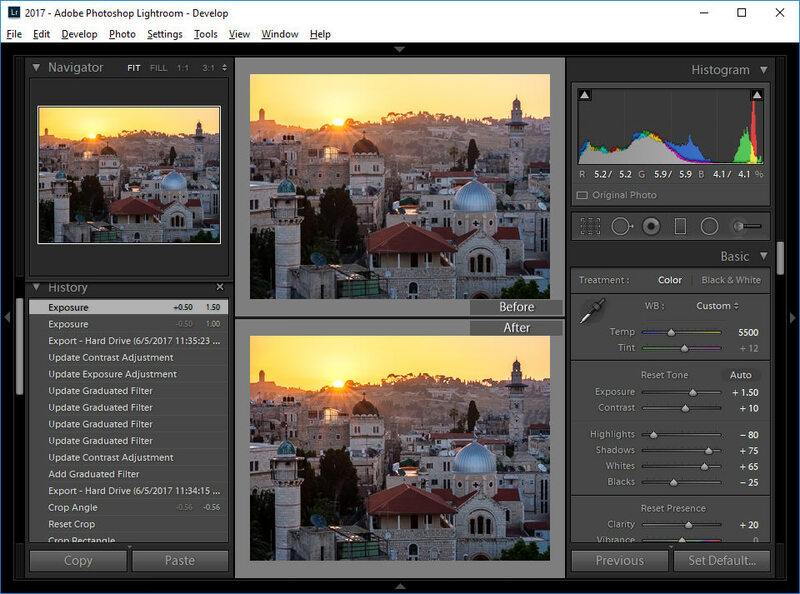 Could somebody please explain me why the ” \ ” never ever worked for me .. I’ve been using lightroom for over 3 years now .. And with both my computer. Desktop pc and surface 4 it never worked. 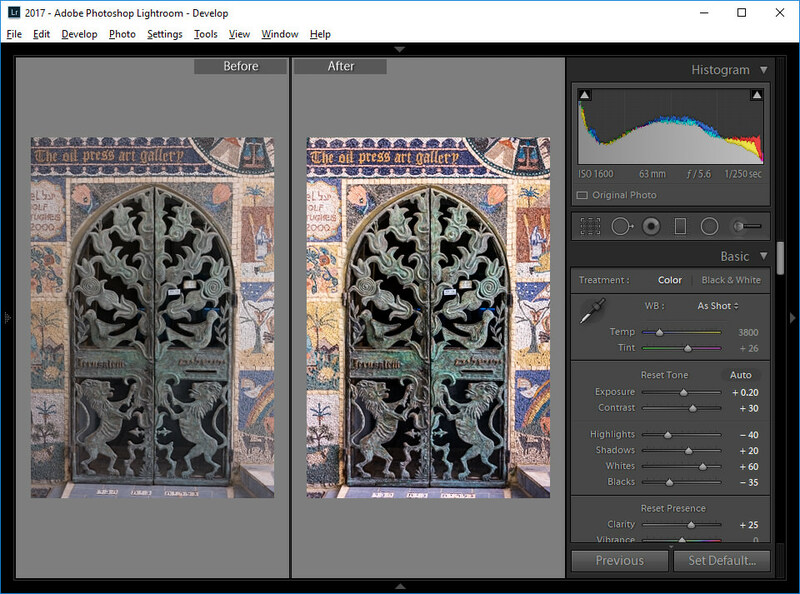 I’ve been dying to be able to see a real before and after in lightroom instead I am still stuck with the “left / right” . I tried changing my keyboards options to english US and different others.. Since i’m french canadian …never worked. Why wouldnt it work for me ? I have the same problem as I live in Spain and have a Spanish keyboard connected to my computer. It affects PS as well so that the keyboard short cuts suggested in presumable USA web sites, don’t work on mine. The way around it is to find where the symbol lies on your own computer. For example, to view before/after on mine, I need to press Alt + the key to the left of number 1, where the \ stroke lies. Using the square brackets in PS to adjust the brush parameters just doesn’t seem to work on my Mac here, but I have found out that by holding down together Shift + Ctrl + Alt and at the same time hold clicking and moving my mouse from side to side and up and down, I am able to adjust the brush diameter and hardness very easily. Thank you very much Bernard i’ll try to find the shortcut ! In Photoshop Elements there an Enhance drop down with Auto Smart Tone being the first choice. The program then offers four possible options. 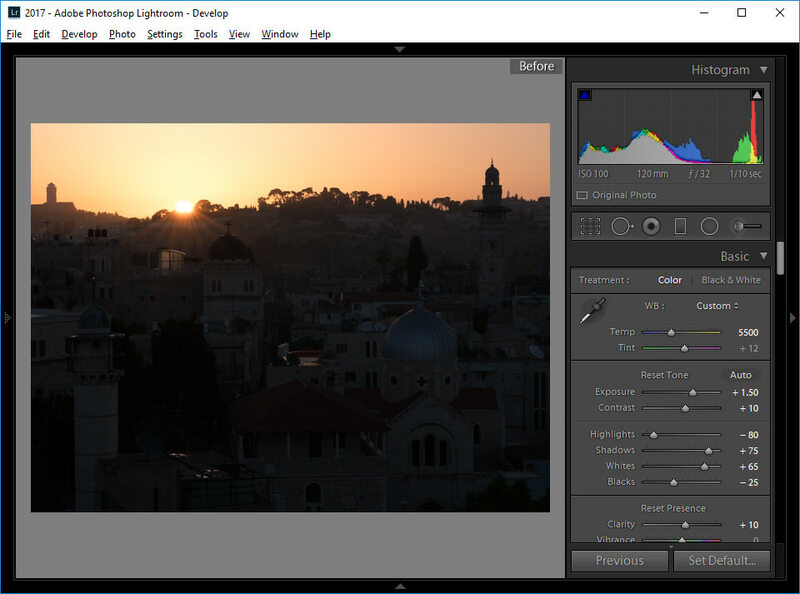 How is LIghtroom a better option? Great article, Nasim. It reminded me of the one of the (usually forgotten) little jewels that LR features. Especially useful the tip about changing the Before state. Thank you! Thank you, Nasim! This is real magic, can’t wait to try it. Only Lightroom tool can do this? On one forum I’ve seen the tool letsenhance.io/ – AI, neural networks and other super smart stuff, interesting to try.